In 1956 two Bell Labs scientists discovered the scientific formula for getting rich. One was mathematician Claude Shannon, neurotic father of our digital age, whose genius is ranked with Einstein’s. The other was John L. Kelly Jr., a Texas-born, gun-toting physicist. Together they applied the science of information theory—the basis of computers and the Internet—to the problem of making as much money as possible, as fast as possible. Shannon and MIT mathematician Edward O. Thorp took the “Kelly formula” to Las Vegas. It worked. They realized that there was even more money to be made in the stock market. Thorp used the Kelly system with his phenomenonally successful hedge fund, Princeton-Newport Partners. Shannon became a successful investor, too, topping even Warren Buffett’s rate of return. 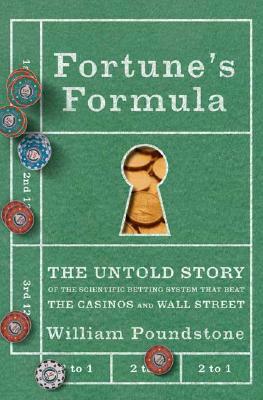 Fortune’s Formula traces how the Kelly formula sparked controversy even as it made fortunes at racetracks, casinos, and trading desks. It reveals the dark side of this alluring scheme, which is founded on exploiting an insider’s edge. Shannon believed it was possible for a smart investor to beat the market—and Fortune’s Formula will convince you that he was right. William Poundstone is the bestselling author of nine nonfiction books, including Labyrinths of Reason and The Recursive Universe. In 1956 two Bell Labs scientists discovered the scientific formula for getting rich. One was mathematician Claude Shannon, neurotic father of our digital age, whose genius is ranked with Einstein's. The other was John L. Kelly Jr., a Texas-born, gun-toting physicist. Together they applied the science of information theory—the basis of computers and the Internet—to the problem of making as much money as possible, as fast as possible. Shannon and MIT mathematician Edward O. Thorp took the "Kelly formula" to Las Vegas. It worked. They realized that there was even more money to be made in the stock market. Thorp used the Kelly system with his phenomenonally successful hedge fund, Princeton-Newport Partners. Shannon became a successful investor, too, topping even Warren Buffett's rate of return. Fortune's Formula traces how the Kelly formula sparked controversy even as it made fortunes at racetracks, casinos, and trading desks. It reveals the dark side of this alluring scheme, which is founded on exploiting an insider's edge.